Got a thought while I was in my office cafeteria and coming out after lunch. There was a banner where "Health" and "Wealth" was written and the common characters in these two words "alth" striked me and tried a digged a bit dipper to figure out if I could get something out of these two words and Aha I figured out in few seconds of thinking. The difference: HEalth is for individual and WEalth is for community/for many ie. it can be your family members. What a nice meaning I could derived from these two words !!! Today, 9 years ago my beloved Mamma (http://www.rameshwari.com/) left me because she was suffering from Cancer. Mamma, I miss you a lot and sometimes become very emotional remembering you. I am so unfortunate that I couldn't get opportunity to serve you the way I wanted to server you all. With your blessing and guidance I have got many things in life but always miss your presence. My whole life is dedicated to you Mamma. Just a thought randomly came in my mind once when I had some time to think and tried to understand a quote that every one knows "Nothing is free, everything needs to be paid". This might be of no value for others but decided to express this whatever I thought here - in my blog. I tried to see my surroundings of whatever we do, wherever we live - be it be in home, office, family, whatever we have till now, whatever we are going to get in future; everything is paid and everything needs to be paid. This statement is true when you are in office: To maintain a good relationship with your collegue/friends, you need to invest good time with them, you need to understand them and act accordingly. This statement is true when you are in family: To maintain a peaceful and growing family environment in your home, you need to invest good time with your family member, you need to understand their need and act accordingly. See whatever you have till now around you and you will know hardly anything has come for free. Either your educational certificates, the belongings in your home, the gift you have got from someone (that is also paid in other form - if you wouldn't have maintained a good relationship with your collegue/friends you wouldn't have received them), everything! Expecting something to be free is the root cause of the problem and lead to dissatisfaction, anaxity, greed and ultimately throw a person in wrong direction. Some of my thought that was written about 4-5 years ago that was laying on my earlier website (http://bb.domaindlx.com/sheo/). Few days before I felt I need to revisit this website and see what I used to think earlier and what I think now. Amazingly its almost same ! Life is a mission, keep your eyes on target. Limit your expectations, Break your dream, Live in reality. Please read as Hindi "Mithi-Mithi bato se aap kisi ka man jit sakte hain dil aur dimag nahi, Man to phir bhi pariwartansil hote hai"
What is the benefit? if you get temporary benefit. Your external behaviour shows your internal thought. Dreaming is not enough to get success, you will have to chase it in reality. One should do ones' work perfectly without seeing how others' are doing. Make a single goal and invest your full potential in achieving it. Please read as Hindi "Sapne dekhne me mehnat ki koi bhumika nahi hoti, lekin us sapne ko sakar karne me mehnat ki mahatwapurna bhumika hoti hai"
Controlling and concentrating of mood is the key of success. Use your good time & good opportunity to do good work. One can be made mad just for time being, not for forever. Note: If some of my thoughts resembles other's, please take it as an co-incidence. I’m asked, how did you learn what you know ? Today I read "I’m asked, how did you learn what you know ?" from Joe Stagner and this inspired me a lot. This is a great inspirational post for everyone, Some of the points are applicable for all whether they are into Software field or not. Thanks to Joe for sharing these his tips for better career and better life. Heard the news that Michael Jackson died, despite I am not too much involved in music stuff I feel its a great loss for Pop world as a lot of people says. It was unfortunate I should say that just before 2 days of his death I heard that Michael Jackson is going to perform in O2 Arena in London in July. I was staying beside 02 Arena when I was in London few days before. A pop start like him whose music album has broken all records of sell in the history died in debt. This news is something that teach us some lessons. My condolence to Michael Jackson and his family. Is in York, about 2 hours from London city. 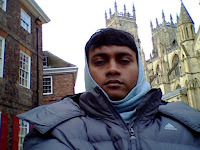 York is very historic and beautiful city, though it is very small I enjoyed it. I could visit its most of the placce in a single day in few hours. Its amazing experience. I guess its one the beautiful place I visited in the rececnt past. I enjoyed the snow for the first time in my life in York, Thanks York :) for that. It was unforgettable experience. 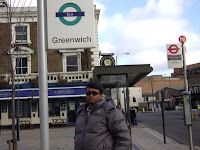 Also got chance to visit Greenwich in London (GMT), it was a too chil that day and enjoyed the snow. It was amazing experience seeing the clock that was desiged several years back and how they struggled to invent time and right type of clock. 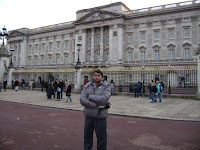 Yes, this is Buckingham Palace, a huge, historic, beautiful and well maintained palace. Few days back my interview has got published in Indian Startup Arena (Though it was given several months back but have been published recently). After a great patience and hassle, finally bought a new flat in Hyderabad. It was a mixed experience for me and happened in just a few days. I wanted to thank to the Bank Manager of State Bank of Indore, Miyapur (Mr. Gautam) for arranging loan in just 2-3 days and guiding me in the process of buying the flat as I had to fly to UK just after few days of submitting the documents. 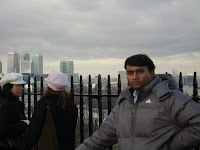 Due to many works going in parallel these days I am not able to give time to my website www.dotnetfunda.com but planning to start writing article when I will be in India.